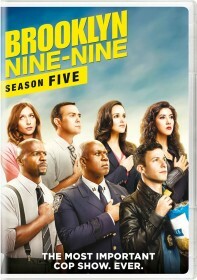 The fourth season of Brooklyn Nine-Nine will be released on DVD this August. The three-disc box-set will include all twenty-four episodes from the show's latest season along with bonus deleted scenes. In the United States and Canada, the DVD is out Tuesday, August 22 and can be pre-ordered now from Amazon.com. In the United Kindgom and Ireland, the DVD will be released Monday, August 28 and is up for pre-order from Amazon.co.uk.